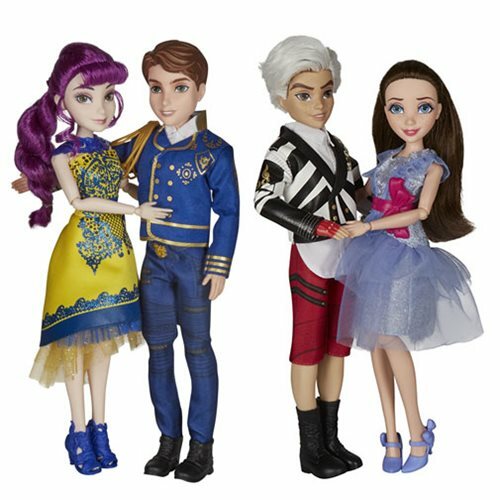 Shopping for Disney Descendants Dolls? Bring home awesome dolls from Disney's Descendants 2! Join the fun goings-on at Auradon Prep with Ben, Mal, Jane, and Carlos! Each collectible doll set includes 2 dolls with rooted hair and cloth clothing. Case contains 3 individually packaged doll 2-packs. Bring home awesome dolls from the Disney movie Descendants 2! The children of classic Disney characters are in school and having the usual problems, except now the villainous kids are joining the fun goings-on at Auradon Prep. Each collectible doll set includes 2 dolls with rooted hair and cloth clothing. Collect them all! Ages 6 and up.